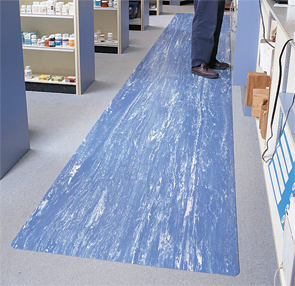 Ideal for labs, check-out counters, banks, and pharmacies, this anti-fatigue floor matting alleviates foot, back, and joint pressure and stimulates blood circulation without taking away from the professional aesthetic of the environment. The smooth, stylish marble-pattern top surface of heavy-duty rubber is easy to sweep or damp mop, and is available in multiple colors to match any surrounding. Revolutionary UniFusion™ bond technology uses heat and pressure to fuse the top surface with a dense closed cell foam base creating a one inch thick floor mat. Sloped beveled foam on all four undersides allows for easy access onto and off the matting.